titel: HEITOR VILLA-LOBOS, JORGE CARDOSO a.o. composers: Heitor Villa-Lobos, Ariel Ramirez, Jorge Cardoso, Sàtyro Bilhar, Ricardo Ojeda. 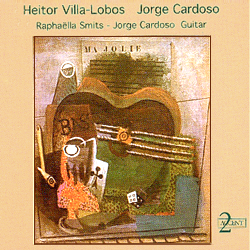 HEITOR VILLA-LOBOS, JORGE CARDOSO a.o. and leads us into heaven! "While Latin-American music maintains various links with western culture, it is above all the guardian of particular performing traditions, which have today disappeared in Europe. In the course of many South American tours, Raphaella Smits has made the essential characteristics of the music in these countries her own. On this CD she puts her talent at the service of each work, among which there are very well-known pieces. This recording demonstrates perfect respect for this magnificent tradition." "We get to know a Villa-Lobos with two faces: the man of the five beautiful but severe preludio's, and at the same time of a popular "Brasilian Suite". Once again Raphaella Smits shows she's a world-class guitarist." "The best Preludios of Villa-Lobos. La guitarra de Villa-Lobos, apreciado por la brillantez de sus concepciones instrumentales, que ofrecen grandes posibilidades de lucimiento al intérprete, es abordada por Raphaella Smits con una sobriedad inédita : no hay distracción en los elementos decorativos sino concentración en la gran música del compositor brasileõ. Without exaggeration, interpreted with symphonic flight, these Preludes are presented to us in all their musical beauty." "Must-have Villa-Lobos. This is great stuff! I have heard many other versions of these Villa-Lobos guitar pieces and this is now my favorite. The interpretations are almost mysterious. There is great clarity in the recording and Ms Smits' instrument has a wonderfully full sound. I had never heard of Smits until I heard this recording, but she now has my attention." "Unique and exclusive taste for latin and classical guitar." "It's an enjoyable album that once again shows how great Raphaella Smits really is. She won't pin herself down to one genre or period. That's why her CD's are so different from one another: she feels as comfortable with baroque music as with contemporary composers." "With the first recording of the "Tira poeira" of Bilhar, and the "Vals Criollo" dedicated to her by Cardoso, she leads us into heaven." "Based on audio material with Heitor Villa-Lobos playing his first prelude, Raphaella presents us today a more than authentic interpretation of these 'classics'." "A masterly example of superior interpretation art."